A monument commemorates the discovery of gold in the Broomfield area and the development of the Spring Hill Leads. In May 1872, Carter, Brawn and Graham discovered rich gold on Spring Hill. The discovery at Broomfield Gully caused a rush which led to three distinct leads being found at Lewers Lead, Reserve Lead and Spring Hill Lead. 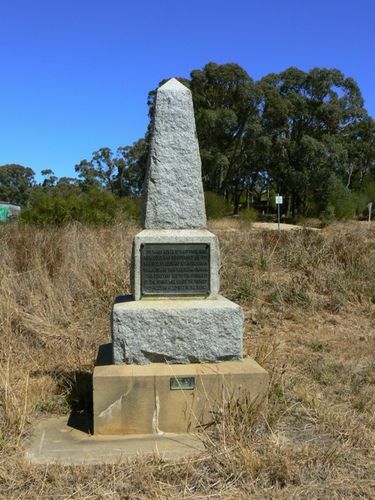 To mark the site of the discovery of gold in Broomfield Gully, a memorial is to be erected on the roadside at Broomfield south of the site of the old shaft of Carter and Brawn's claim. The working of this claim led to the opening up of the deep lead mining in this district. Permission for the erection of the memorial has been granted by the shire council, the cost being borne by Mr. J. A. Graham, president of Old Creswickian Association, who is a son of one of the original holders of this claim. The memorial will stand 9 feet high on a 4-foot base, and will be constructed of granite. A bronze tablet will carry an inscription of the discovery of gold in 1872 by Leonard R. Carter, Edward Brawn and William Graham, which led to the opening of the Spring Hill leads, the richest deep alluvial gold field in the world. Age (Melbourne), 8 February 1939. Brawn, Edward Brawn & William Graham. Deep Alluvial Goldfield In The World.